Furniture Removals Spain - What About Spanish Customs Clearance For Furniture? Furniture removals Spain is something everyone who moves to Spain for the long term will need to think about. Do you want to bring it all? Do you want to sell some or all and start fresh in Spain? Do you want to drive it yourself or hire a professional removals company? One thing that many people don�t tend to think about is customs checks when you reach Spain. Every country has its own customs procedures, and everything that arrives into a country needs to ensure that it meets the required criteria. This is to protect the safety and security of the country itself. Moving furniture to Spain is currently easier than it might be in the future. This is because the UK is, for the moment at least, still a member of the EU. Therefore, any furniture � indeed, goods in general � being moved from the UK to Spain is subject to the free movement of goods procedures within the EU. There are some restrictions, however; for example, you must have owned the furniture for at least six months, and you must have paid VAT when you bought it. 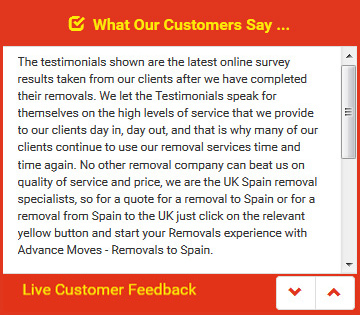 This is why it is important to keep receipts, as they may well come in useful when you reach Spain and want your removals to Spain to be cleared through customs without hassle. Those entering Spain with their furniture from outside the EU (as the UK may be soon) are subject to different rules and regulations. If this is your situation, then you should ideally speak with the Spanish authorities before attempting to enter the country as there will be paperwork to complete. Advance Moves are top of the industry when it comes to furniture removals Spain. We know exactly how to pack, transport and unload your possessions to ensure they arrive at your destination safely and can advise on customs requirements. Our website (http://www.advancemoves.com/) has more information. Alternatively, contact us on 0871 218 0612 or email info@advancemoves.com for bespoke options.